Happy Friday, everyone! My Friday was more like a Monday and I am so happy that it's finally over. It probably didn't help that I got very little sleep last night due to working on today's mani. I knew this mani would be so hard for me to do but I knew I really wanted to do it! For the last day of Digit-al Dozen Re-Creation Week I chose to recreate a mani by the über talented Lindsey from Wondrously Polished that celebrates our mutual love for Chipotle! I used all Elevation Polish polishes for this mani, as well as acrylic paint. My base is Elevation Polish Weddell Sea. If you've been following me long you know this is one of my go-to polishes for nail art, it was also the closest thing I had to OPI My Boyfriend Scales Walls that Lindsey used as her base. The red is Volcanic Dust and the brown on my thumb and in the logo is Thunder Basin. 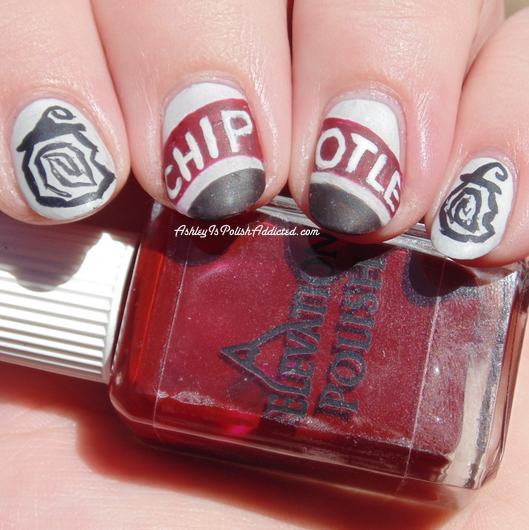 I used white acrylic paint for letters and the chipotle pepper on my thumb, and black acrylic paint for the chipotle peppers on my index and pinkie. The peppers were SO hard for me but they are so freaking cute! 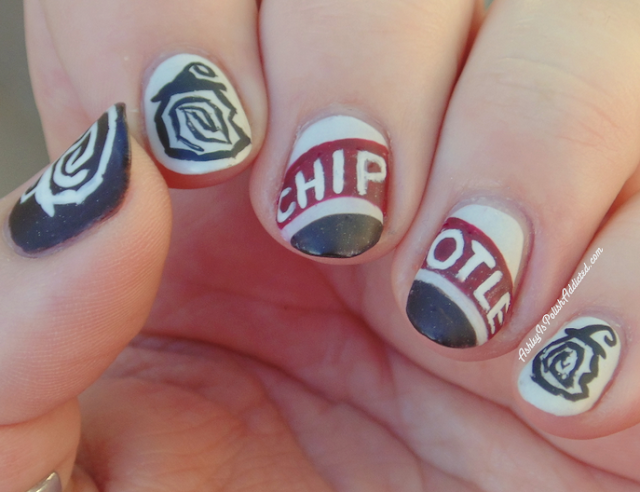 I decided to do white over brown on my thumb as an accent nail to mimic the center of Chipotle's logo. Once my fast dry top coat was dry I topped it off with a coat of Girly Bits Polish Matte'rs. 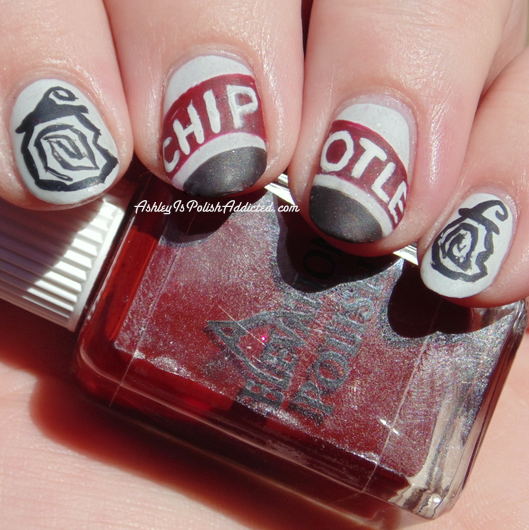 And here is my mani next to Lindsey's (with the Chipotle logo in the middle)! I just want to say how much I have enjoyed this week. All of the ladies in the Digit-al Dozen inspire me and make me strive to be a better nail artist. It was really hard narrowing all of the manis created in this talented group down to only 5 to recreate this week. I wanted to create them all! Apparently Lindsey felt the same way because she did one mani for every current member of the group (excluding herself). That's 17 manis she posted for Digit-al Dozen Week! 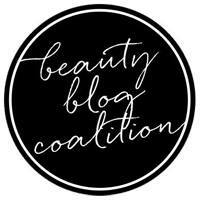 Make sure you head on over to all of the blogs below, there were some really amazing nail art created this week! 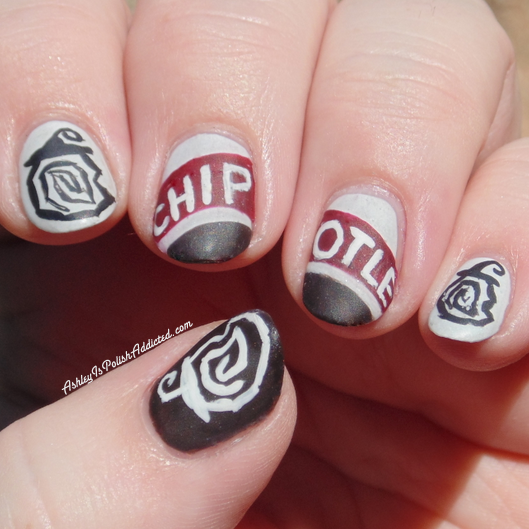 These look so perfect, you did amazing recreating them! !